For increased clamping pressure on the column assembly, wrap it with masking tape. This tape will not stretch or break. You also could try duct tape. Other clamping strategies: Wrap the column with a spiral of surgical tubing or strips cut from an old inner tube. With blade set slightly over 45°, accumulated error becomes an unsightly gap. With blade set slightly under 45°, accumulated error is hidden inside column. Visible corners are crisp. 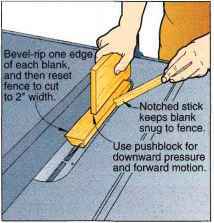 V>~Notched stick 7 keeps blank snug to fence. Use pushblock for downward pressure and forward motion. Masking tape acts as a hinge, letting you roll up the assembly. 3 Chuck a 'A" brad-point bit into your drill press, and drill holes through the end caps, where shown on Drawing 5, making sure that the holes are aligned with the grain, where shown. 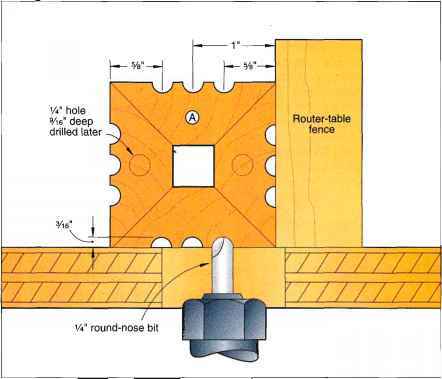 4 Chuck a %" cove bit into your table-mounted router, and set your fence flush with the bit's bearing. Rout the ends and edges of each of the end caps. Note: We routed the end caps in several passes, raising the bit slightly between each cut to reduce chip-out. 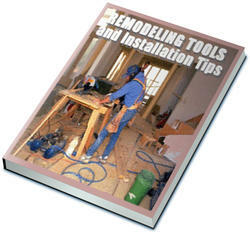 Using a backing board will also minimize chip-out. For safety, guide the stock past the bit with a pushblock. 5 Tap a '/4"-20 T-nut into each of the end caps. See the Shop Tip on the opposite page. for installation suggestions. Then, set these parts aside. 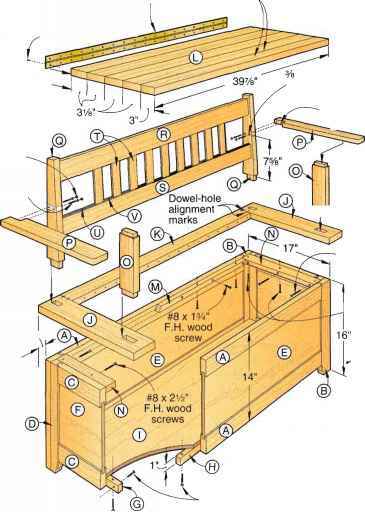 6 Glue and clamp an end cap to each end of each column, as shown on Drawing 6. Remove the clamp when the glue is completely dry. Z Chuck a 'A" brad-point bit into your portable electric drill. Using the holes in the end cap as guides, drill 9/i6M deep into the column ends. Cut 16 pieces of lA" dowel stock to 13A" long, and glue two into each end of the column assembly. No more than 7/i6M of the dowel should protrude. Cut eight pieces of 'A" dowel stock to l3/ifi" long, and glue two into the bottom of each top end cap, as shown on Drawing 5 and Drawing 10. Again, no more than 7/i6" of the dowel should protrude. 8 Rip and crosscut four pieces of Vi"-thick maple QA" thick would also work) to 2x2" to make blanks for the top caps (C). Rip and crosscut a scrap wood carrier board to 2x2x12". Then, cut the top cap to shape, as shown on Drawing 7. Sand the parts, and then glue and clamp a top cap to each of the four top end caps. Refer to Drawing 5.